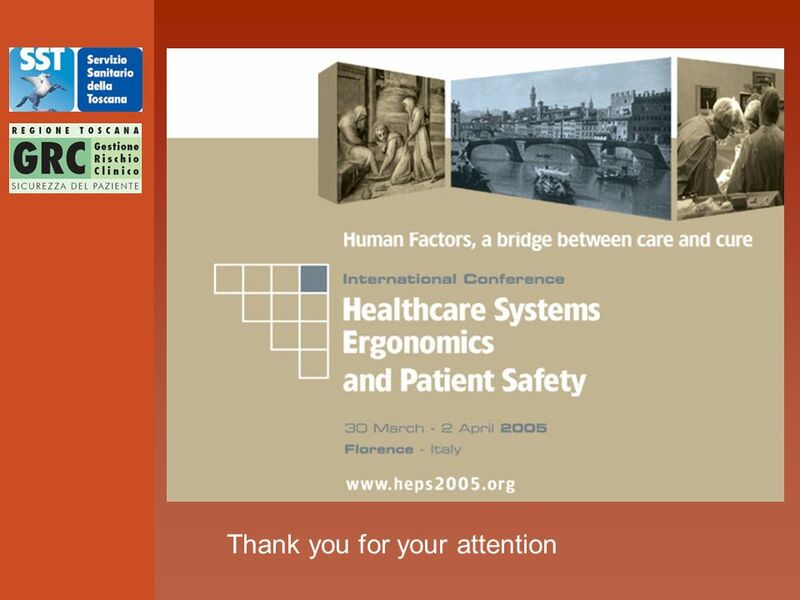 Firenze, 23 Ottobre 2004 Clinical Risk Management in Italy State of the Art Riccardo Tartaglia, MD, Ph. D Clinical Risk Management and Patient Safety Centre. 2 WHEN WHY WHO WHAT did the problem arise? 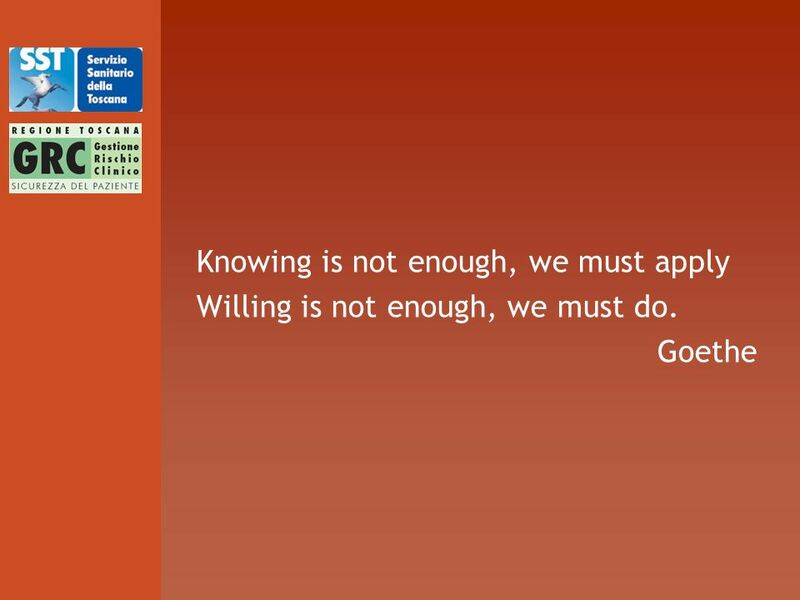 is it important to act? is involved? HOW are our plans ? 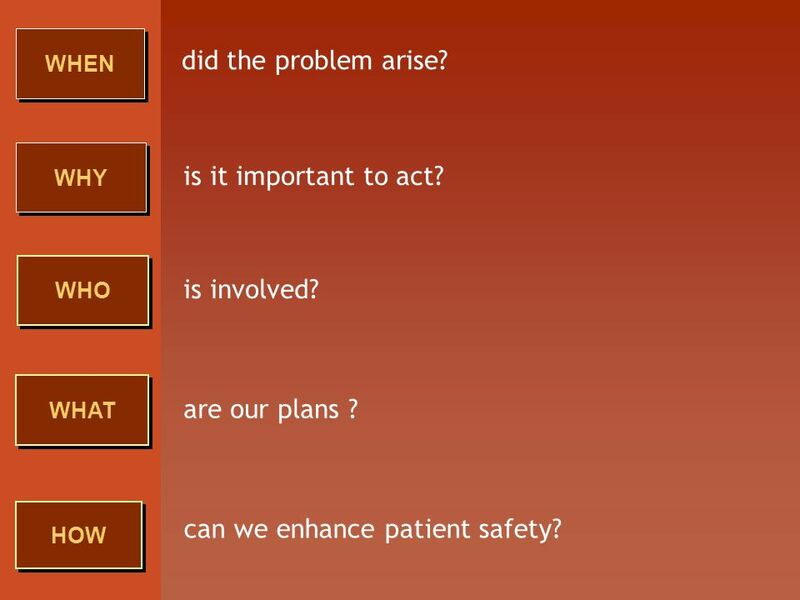 can we enhance patient safety? 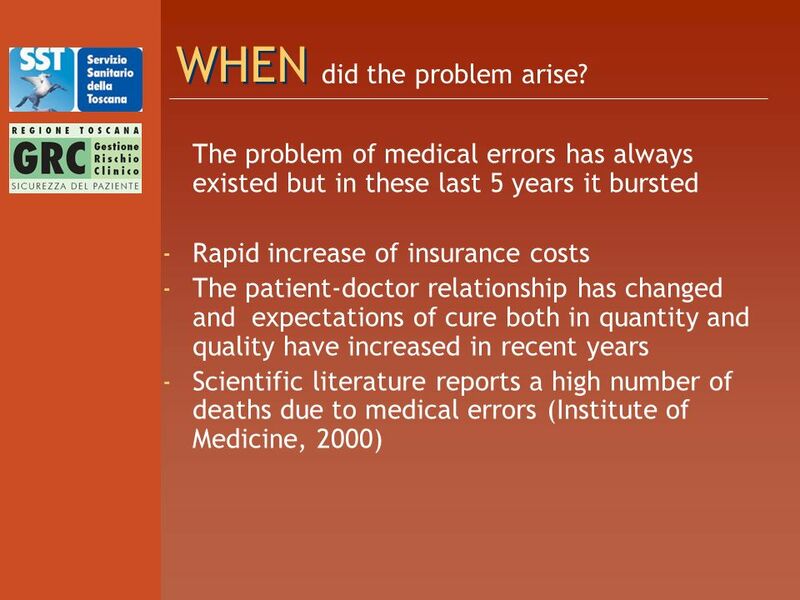 3 WHEN The problem of medical errors has always existed but in these last 5 years it bursted - Rapid increase of insurance costs - The patient-doctor relationship has changed and expectations of cure both in quantity and quality have increased in recent years - Scientific literature reports a high number of deaths due to medical errors (Institute of Medicine, 2000) did the problem arise? 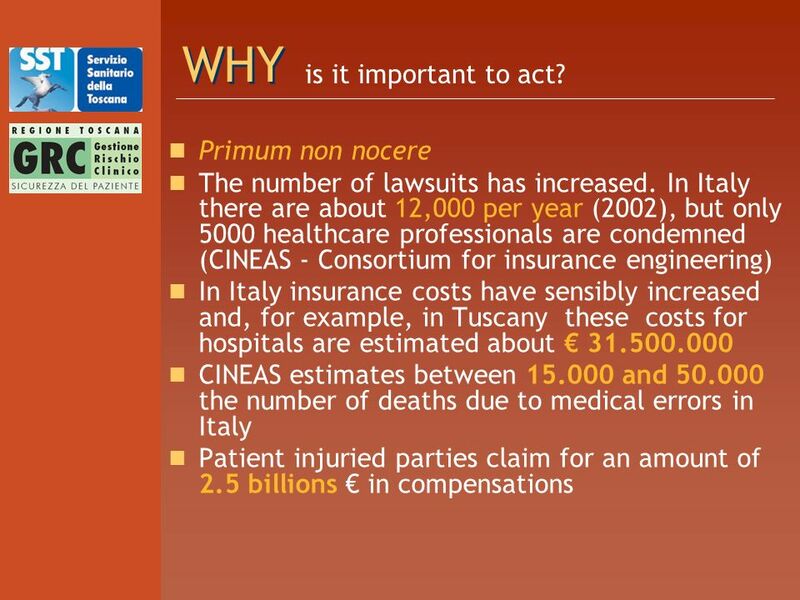 4 WHY Primum non nocere The number of lawsuits has increased. In Italy there are about 12,000 per year (2002), but only 5000 healthcare professionals are condemned (CINEAS - Consortium for insurance engineering) In Italy insurance costs have sensibly increased and, for example, in Tuscany these costs for hospitals are estimated about 31.500.000 CINEAS estimates between 15.000 and 50.000 the number of deaths due to medical errors in Italy Patient injuried parties claim for an amount of 2.5 billions in compensations is it important to act? 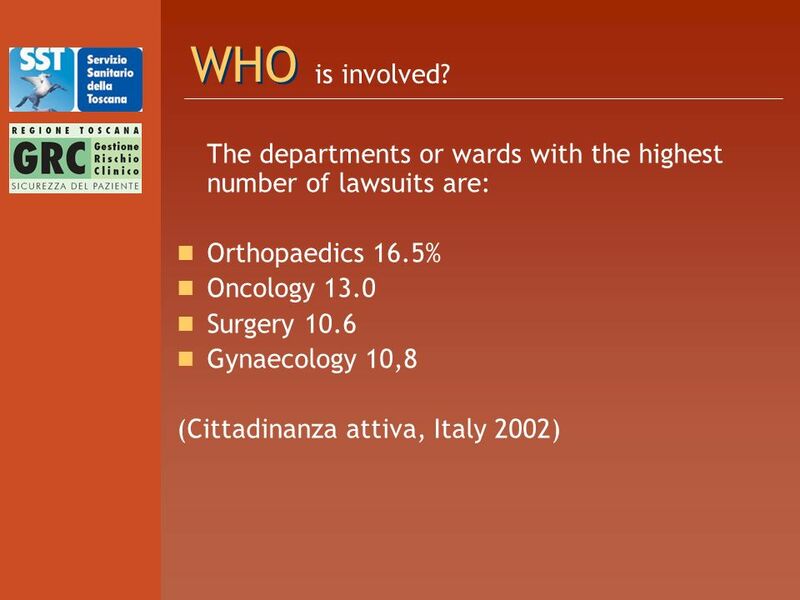 6 WHO The departments or wards with the highest number of lawsuits are: Orthopaedics 16.5% Oncology 13.0 Surgery 10.6 Gynaecology 10,8 (Cittadinanza attiva, Italy 2002) is involved? 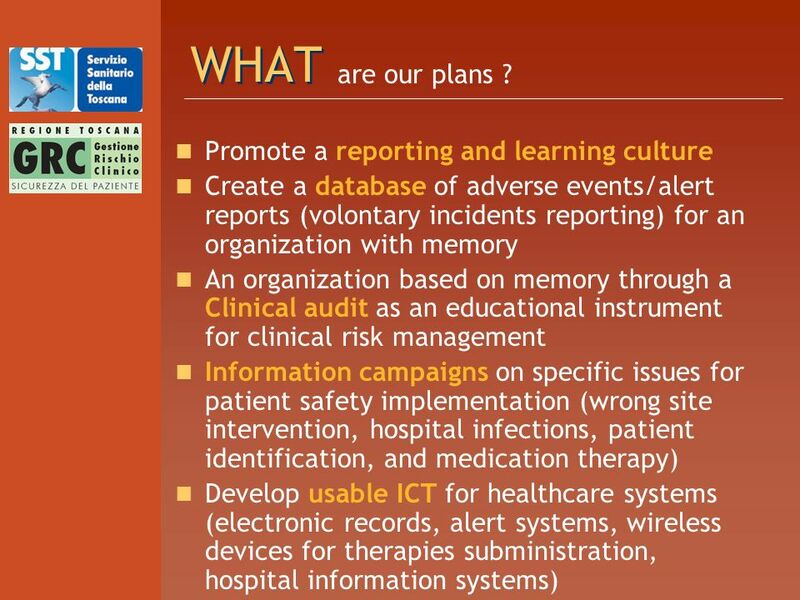 7 WHAT Promote a reporting and learning culture Create a database of adverse events/alert reports (volontary incidents reporting) for an organization with memory An organization based on memory through a Clinical audit as an educational instrument for clinical risk management Information campaigns on specific issues for patient safety implementation (wrong site intervention, hospital infections, patient identification, and medication therapy) Develop usable ICT for healthcare systems (electronic records, alert systems, wireless devices for therapies subministration, hospital information systems) are our plans ? 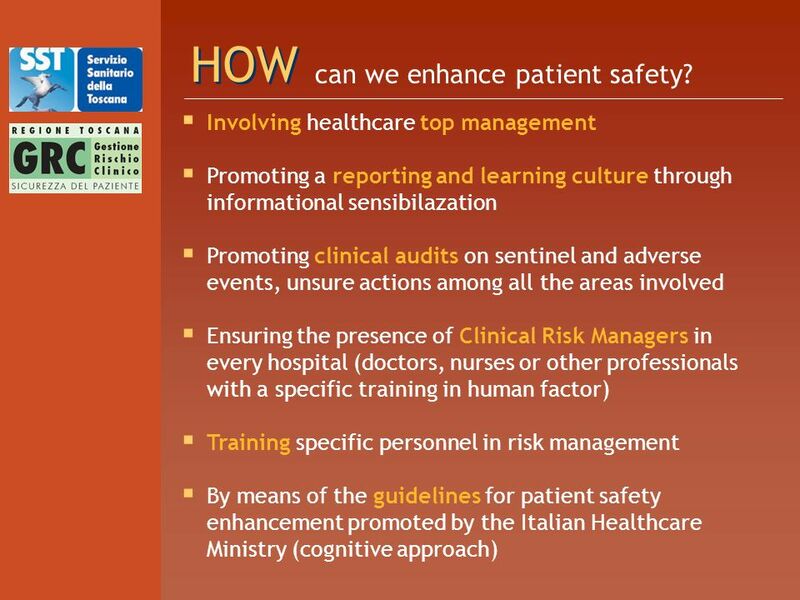 8 HOW Involving healthcare top management Promoting a reporting and learning culture through informational sensibilazation Promoting clinical audits on sentinel and adverse events, unsure actions among all the areas involved Ensuring the presence of Clinical Risk Managers in every hospital (doctors, nurses or other professionals with a specific training in human factor) Training specific personnel in risk management By means of the guidelines for patient safety enhancement promoted by the Italian Healthcare Ministry (cognitive approach) can we enhance patient safety? 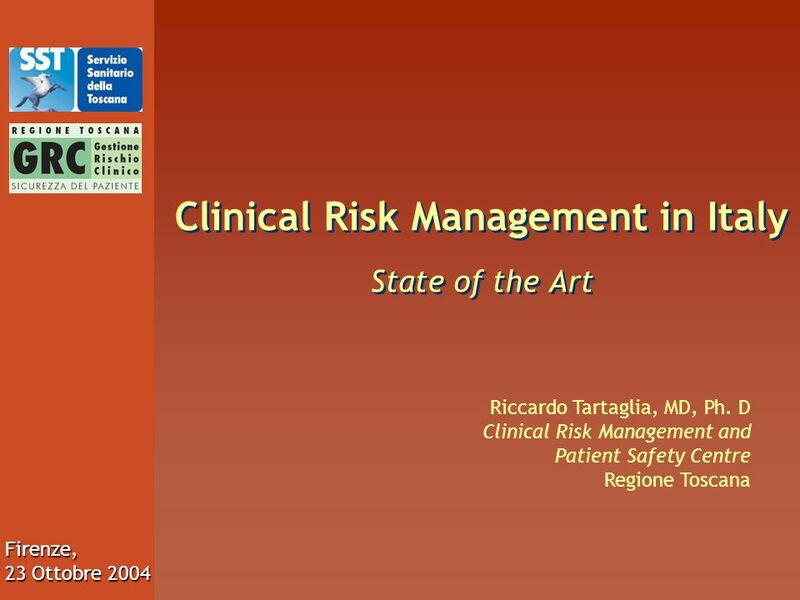 Download ppt "Firenze, 23 Ottobre 2004 Clinical Risk Management in Italy State of the Art Riccardo Tartaglia, MD, Ph. D Clinical Risk Management and Patient Safety Centre." Quality and efficiency in the pharmacy profession Quality throughout the professional life The Finnish Experience Eeva Teräsalmi president, WHO. 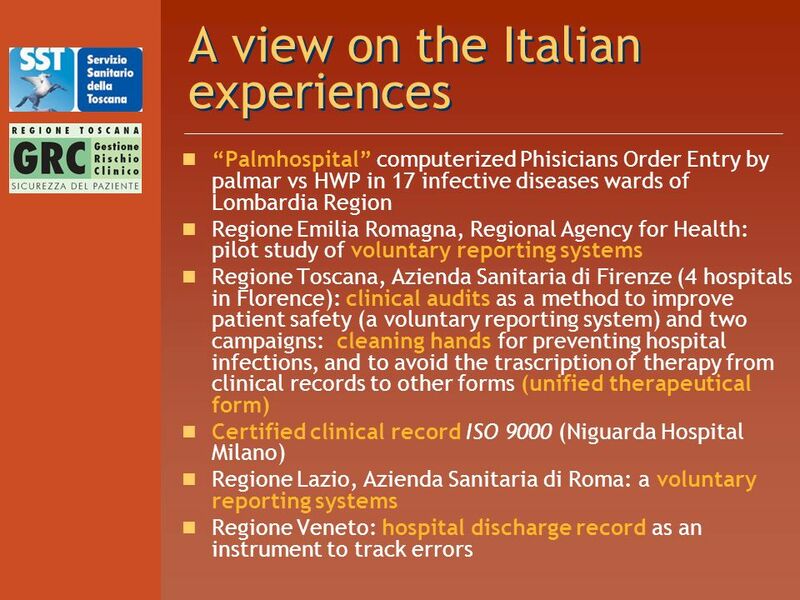 Patient Safety: state of art and perspectives in Italy Carlo Liva Dpt Quality & Accreditation Rome - Italy. Measure Criteria MD Measurement, P4P Phyllis Torda NCQA February 2008. Government P4P Programs: Pay for Performance - Is Medicare a Good Candidate? Albert W. Morris, Jr., M.D. President National Medical Association The Second. 12-1 Chapter 12 Advanced EHR Functionality © 2012 The McGraw-Hill Companies, Inc. All rights reserved. McGraw-Hill. Denis MREJEN GIP DMP HIMSS San Diego Feb Study tour in the French National Electronic Medical Record (DMP) Project Denis Mrejen, MD, PhD GIP – DMP. 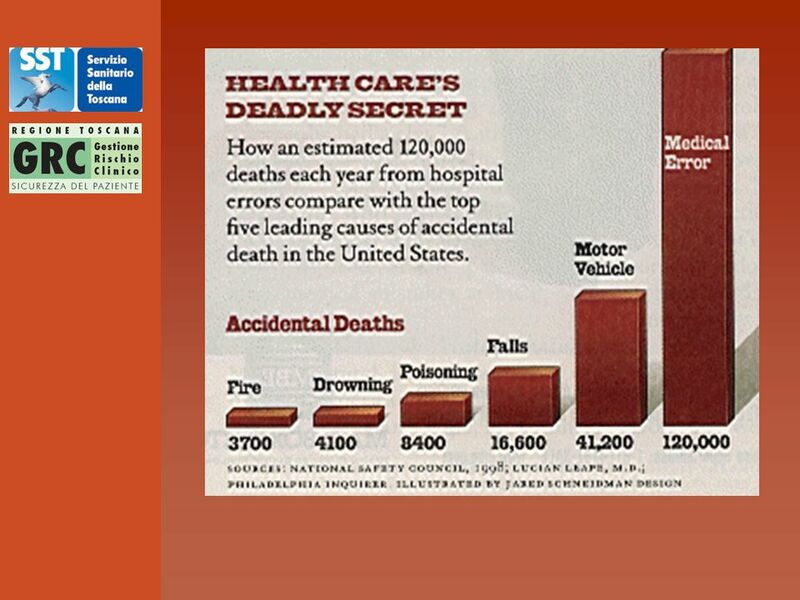 June 4, 2004JLN, MD Associates, LLC slide 1 Facility and Health Insurance Perspectives Joel L. Nitzkin, MD, MPH, DPA IEEE-USA Geriatric Technology Symposium. National Reporting & Learning System (NRLS) Reporting systems are vital in providing a core of sound, representative information on which to base analysis. Adverse Patient Safety Events: Costs of Readmissions and Patient Outcomes Following Discharge Didem M. Bernard, Ph.D. William E. Encinosa, Ph.D.
Utilizing the Electronic Medical Record to Reduce Inappropriate Medication Use Alan White, PhD – Abt Associates Valerie Weber, MD – Geisinger Health System. THE COMMONWEALTH FUND 1 Doctors Use Electronic Patient Medical Records* * Not including billing systems. Percent Source: 2009 Commonwealth Fund International. Aim of programme to apply the principles of risk management to practical situations and relate these to personal experiences to improve the quality of. Safe Surgery Dr. Mohamed Selima. The problem: Complications of surgical care have become a major cause of death and disability worldwide. Data from 56. Services for occupational health.  Under the Ministry of Health, an institute is being develop for medical research purposes. It is INSTITUTE for MEDICAL.